This article was first published in the blog section of Ramez Naam’s website on 10 August and is republished here with permission from the author. Ramez Naam is an award-winning writer of non-fiction and science fiction, a speaker and entrepreneur. He spent 13 years at Microsoft, where he led teams developing early versions of Microsoft Outlook, Internet Explorer, and the Bing search engine. His career has focused on bringing advanced collaboration, communication, and information retrieval capabilities to roughly one billion people around the world, and took him to the role of Partner and Director of Program Management within Microsoft. 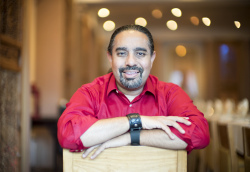 Between stints at Microsoft, Ramez founded and ran Apex NanoTechnologies, the world’s first company devoted entirely to software tools to accelerate molecular design. He holds 19 patents related to search engines, information retrieval, web browsing, artificial intelligence, and machine learning. If you liked this post, you may want to check out his book on innovating in energy, food, water, climate, and more: The Infinite Resource: The Power of Ideas on a Finite Planet. i think there is a huge error in the comparison of electricity cost from solar to coal. Assuming the predicted solar cost is true, let us not forget that the availability of solar power is roughly 1500 hours per year for areas within the Tropics and less than that value as the location goes away in latitude from the equator. Coal power generation facilities annual availability is at least 7500 hours annually. Electricity is used 24 hours per day and the measure of the electricity cost must be levelized to at least 8760 hours annually. Let’s be fair on how we present these numbers as the uninitiated does not understand the impact of availability on the economics of electricity generation. The ordinary consumer most likely use electricity at its peak between 6pm to 10pm in the evening, a time during which on grid solar power is NOT available! For solar power to be truly “equivalent” to coal price is to bundle additional technologies such and Energy Storage Systems (ESS) to provide the electricity during periods when there is no sun. This concept is called Off Grid Solar. If solar systems are off grid, and to achieve the equity returns coal power generation facilities can achieve, the cost of electricity approaches those generated by distillate #2 fuel oil fired diesel generator sets – which is nowhere competitive. So let’s be more balanced and realistic. The key is to develop lower cost of ESS and the associated control systems to manage the system. So.. when the sun shines we’ll be on 100% solar and use cheap electricity. When the sun does not shine the electricity will be expensive so everybody will try to switch their power usage to the times when there is sun and power is cheap. Also – take note – everything non-solar-or-wind will have to be able to stop and idle until there is no sun or wind. Nuclear cant do that. Big coal too. So? Problem is: Easier said that done! We had been doing demand shifting as an energy management tool, twenty years ago. But there are demands that can’t simply be moved away from a certain time frame of the day. Base load plants – non solar or non wind – are NOT designed to stop and idle to wait until the sun sets or wind calms down. With all due respect, it is the wrong philosophy to make non solar and non wind PGFs to stop or idle waiting for the sun to set or wind to calm down. It simply drives electricity cost thru the ceiling! In the mean time, Tesla and other companies are manufacturing batteries on a massive scale. Using these, and other technologies such as hydropower storage, we can level out the supply and demand differences. I would not agree with you to go ‘off grid’. By using utility solar and utility storage, peak supply and demand can be averaged out much more efficiently than if everyone would simply go off grid. What do you think? Good points – but remember I am located in the Philippines and unlike Europe, we do not have the benefit of multi-grid systems. We are limited on our grid and NOT MUCH to compare with Europe. Hence the levelling of supply with demand is not possible in our situation. So, let be more balanced and realistic. Coal and nuclear power baseload plants produce electricity around the clock even in time when there is minimal need for it. It is a bug and there is a wide variety of arrangements to find some use for nighttime electricity overproduction – pumped hydro storage, price discounts for consumers to consume mostly in night, even free of charge electricity for electric water boilers (in Belgium), selling to other grids for a trinket, etc. And it is important to say, baseload-shoulder-peak power system is a possible solution, not a condition, of “right amount of electricity in the right time” problem. Addressing your last point first: LCOEs for PV in Med’ basin are around 5ecents/kWhr (source: Prognos). Costs for diesel gen sets are typically in the range 20 to 30 ecents/kWhr (source: PWR). Storage from LifePO4 batteries based on 4000 70% DOD cycles are around 12.5eurocents (source: PWR). A variety of control strategies can be used to mitigate PV overproduction (day time) with the need for A/C (night-time). Taking an aggregate approach (single PV installation, single storage, group of houses) will deliver a materially better result than diesel. Also: 25 year lock-in of prices (because generally speaking the sun tends not to send invoices). I fail to see how having an “equity return similar to a coal station” is relevant to the above. However…. Speaking of coal stations – I see that EON and RWEs coal stations are now running at a loss (as German wholesale prices tank). Still they are fully amortised – try building a new coal station now, in Western Europe, with proper abatement (not CCS – just sulphur, mercury nox etc) – depending on who you speak to LCOEs for such stations look to be well North of Euro90/MWh – oh dear what do I see? Wholesale prices around 40? or (4 years hence) 30/MWh – perhaps not quite what you meant by “having an equity return similar to a coal station” – that would be a Euro60 loss for each MWh generated? Of course Europe is not unique in wanting to address “coal externalities” – one only needs to look across the Atlantic – as the free “equity rides” of yesteryear get terminated. Finally, RES intermittency can be addressed through a wide range of actions/technologies, batteries are but one of several & we certainly do not need to wait for them to come down in price to address intermittency. “Taking an aggregate approach (single PV installation, single storage, group of houses) will deliver a materially better result than diesel. ” – show me the economics. It is easy to generalize, but when you input the cash flow to cover debt service, the LCOE is reduced to be meaningless as the cash flow for the solar + ESS can NOT pay for the debt service with the numbers you are quoting. I am from the Philippines and conditions are different from Western Europe, in regards to Coal and Nuclear. The article is about PV and not the system cost. It doesn’t start about natgas externalities either does it. Further on storage cost will be neglectable. With advanced wind atba CF around 80% for under 1ct/kWh the role of PV is clear to me. For now, and for many years to come, solar’s intermittency is more of a theoretical problem than an actual problem. In most places solar peaks exactly when demand peaks, a happy coincidence! As its share of generation increases it may become more of an issue, but there are a lot of potential ways of mitigating the problem that aren’t too costly. For instance, combining solar thermal with solar PV to provide 24hour power is looking very cost-effective in some new projects in Chile. Alternatively, demand response is a very cheap ‘source’ of electric power, and a way to mitigate intermittent solar that is becoming more common and practical as grids get smarter. Lastly, electric batteries provide a lot more value to the grid than just backup for solar or wind, such as frequency response and avoidance of capital expenditure on transmission facilities. So they are going to be installed in ever increasing numbers whether they are needed to backup solar or not. Once installed they can serve all these functions at the same time, so it is not necessarily fair to saddle solar with all the cost of battery backup to make an apples-apples comparison with coal or gas. On another point: this future projection of the speed at which solar PV will be adopted seems way to conservative- basically doubling every four years. I don’t have the figures in front of me, but I thought that the historic rate was closer to doubling every two to three years (at least in the US.) And it seems like the rate of change should accelerate as prices fall below competing technologies. 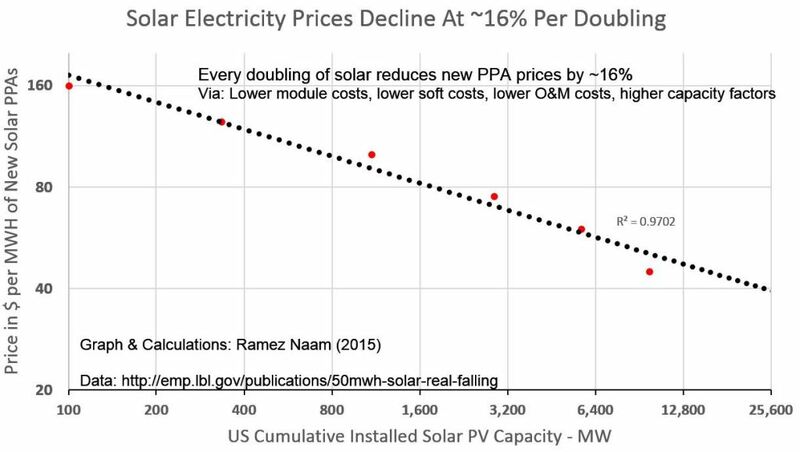 Solar has been the highest cost electricity source until recently. Now, as it is becoming cheaper than all other sources, it should start doubling even faster, right? Let’s be fair: The electricity peak demand is during the day in most of Europé when solar is available. So solar will dispatch mostly expensive NG plants until it is has the penetration levels as in Germany! A huge benefit for all except for the utilites that cannot any more demand the prevous peak prices for ALL their production during the day. In our part of the world peak demand occurs between 5pm to 10pm when the sun is no longer available. The solution is to store electricity from solar farms and use these on the evenings – in order to be at equal comparative matrix with coal or nuclear. And I still have to be convinced if the economics of solar + ESS can compete with coal or nuclear. Again, to use LCOE as matrix of economic cost of electricity, it must be based on 8760 hrs. We all know that Germany paid a huge price for its solar capacity. The current cost of generation from these partly or fully depreciated solar farms can’t be used to argue that coal or nuclear are more expensive. Adel, by ESS do you mean molten salts like used in CSPs in Spain? Quite brilliant and half the cost of batteries. Price is not the only factor. Cells have to become more efficient so as to allow smaller surfaces to provide more electricity. Storage must become cheaper and more available. The situation in 2035 will be determined by the combination of these factors. Isn’t that issue addressed by the fact that the costs presented are per MWh produced, instead of by installed capacity? In my view, a more pressing issue is the non-integration of storage/balancing costs in these prices. In most cases these RES installations are freeriding on the net. Balancing is not a cost for a power plant, it’s a revenue which is usually kept as a monopoly for large power plant mainly because TSO/DSO are still using outdated softwares written in COBOL… Every time market barriers are removed decentralised generation, batteries and DSM are much more flexible and competitive than large power plant and are able to give more services like islanding. Opening this very lucrative market would actually lower even more the cost of a MWh. indeed the REs are free riding on the Network! As 50MW solar (INTERMITTENT) needs to be backed up by a similar 50MW FIRM CAPACITY somewhere and thus adds up anciliary cost. Don’t get me wrong – I am an advocate to RE – as we have our OWN Solar and Hydro IPP Projects, but to expect these to be displacing COAL and HFO fuels is kinda stretching it…. Same goes for all other plants. And it is not the intermittency that is the problem – but the unpredictability. Solar and solar are intermittent but not unpredictable – so the TSOs can handle them the very same way they handle the (dont forget) intermittent and unpredictable demand. Nuclear on the other hand is highly unpredictable – at any given second the automated control systems at any given NPP can decide to pull a block out of the grid. Any second, without a warning – bam – minus 1000 MW and it takes just a second to do that. And our TSOs are prepared for this very.. very expensive exercise. So wind and solar are rather OK. I beg to disagree on the predictability of solar. Yes the sun rises every morning and sets every afternoon, but the real output is nowhere predictable in between those time as weather and ambient conditions determine the output of of the solar or wind power generation facilities. 1Gw Nuclear plant going out in a second? NO WAy! Any power generation facility worth its salt and properly engineered doesn’t operate or behave that way. Absolutely not! In the very limited knowledge and exposure of mine, more than 5Gw of power generation facilities, not a single one ever went out in a bam! I stick my guns on the need to provide backup capacity for every watt of intermittent capacity installed in a grid. And as a power generation engineer, I never will allow a technology that’s “unpredictable” to be installed. And any investment banker worth his salt will never sign off a project to finance an unpredictable technology. With new weather forecasting techniques specifically invented for wind and solar we are now able to forecast their production with enough certainty so it is in fact like a base load. It is very misleading to imply that only NPP can unexpectedly trip. ALL the conventional power plants (coal, gas, hydro) can be disconnected from the grid without warning for an internal (loss of a major component) or an external (grid tension too low) reason. Wind or solar plants are not exempt from these “unpredictable” shutdowns. If the wind turbine bearings temperature gets too high, it will be disconnected. If a solar panel inverter fails, it will be disconnected. The real issue with Wind and Solar is that they are unable to take part in frequency regulation and they have no grid inertia. Thus grids with a high penetration of renewables are way less stable. So wind and solar are not rather OK regarding grid stability. And losing 1000 MW is not an expensive exercise. 3000 MW of capacity dispatchable in less than 30s (the biggest power plants have to leave ~10% of their nameplate capacity unused and available to the TSO) are always on standby in Europe to cover all the intermittency and the unpredictability inherent to the network operation: loss of a major power producer, connexion of a major consumer, unexpected solar eclipse. This power reserve costs the TSO about 20€/MW/h. So, peanuts. the TSOs expect any nuclear block to disconnect at any given second and it just happens 1-2 times per year without notice. I’m assuming they use weather forcast to make wind and solar predictable. Since there are many “small” turbines and solar panels, the impact when they break down is small compared when a large coal or nuclear plant stops. I am going to answer to all of you. It is true this reserve has been sized by taking into account the loss of the two biggest power plants in Europe (2 nuclear plants in France), but it’s not at all its sole purpose. It is used to face the unexpected imbalances between production and consumption. The figures given for the reliability of the German grid measures the average loss of power duration for the consumers. It mostly counts the number of time a tree fell on a line causing a local blackout. It has very little to do with renewables penetration and power generation. On the other hand, the number of “grid intervention events” (i.e. the times when TSO operators had to perform an action to restore the integrity of the system) has broadly increased these last years. Moreover, the yearly balancing cost has also increased. See the end of the article, even though the author might not understand what he wrote. The stability of the grid -tension wise- depends on the number of buried line. The stability of the grid -frequency wise- depends on how you produce your power. Funny you gave this explanation because buried lines increase the capacitance of the line and leads to voltage drops. Even though a distribution grid with buried lines is more reliable in terms of power cuts (a falling tree can’t cut a buried line), it is also more costly to operate as you have to locally balance the reactive power. In case of imbalance between the consumption and the production, the frequency will drop (or increase) as the missing energy is taken from (or given by) the spinning inertia of the turbine rotors. As solar and wind are connected to the grid using rectifiers and inverters, they are isolated from the grid frequency. Thus, in case of imbalance, the frequency of a grid with lots of renewable decreases more rapidly than the one of a conventional grid. The primary reserve has to be activated more quickly to restore the grid integrity. It is causes a lot of stress on the electrical system. Using batteries, wind and solar can take part in the grid balancing. Still it’s way more expensive to use batteries, as power plants using (gas, steam, water) turbines and synchronous generators inherently regulate the grid as I explained above. However, a funny and cheap way to regulate the grid using batteries is to use the ones installed on electric cars! See Dr. Willett Kempton works on this subject. His ideas have already been tested on the PJM network. Don’t get me wrong, I am all in for renewables. Fossil fired power plants are absolute craps which have to be taken away from the grid. However, it’s burying its head in the sand to maintain that solar and wind are as efficient as conventional plants in terms of grid stability. We are all smart enough to see these!! Otherwise we aren’t even exchanging our views now! Maybe the production of solar and wind can be predicted for the following day but still, going to be different from the previous day – which qualifies to my definition of being intermittent, requiring a set of support facilities to cover for the increase or decrease of solar or wind production – and do you think that energy used to compensate is free?? I believe you are smart too to know it’s not! Now i got somebody who speaks my language!! Your arguments multiply its impact if you are in a system like ours where the reserve is less than 5% to 10% at best of the peak demand. There’s no way wind and solar can stabilize my grid! But also I am pushing RE too!!!! Very good discussion. Failure mode – how does a system fail – what happens when the largest generation component (or components) fails. The answer for nuclear will, by definition give a different result than a 10MW wind farm. In the case of FR (primary & sec’) the TSOs are still struggling with this. But there are pointers – such as Etosgas/Audi Werlte P2G plant which provides secondary (and can technically provide primary) response. Responding to minutes to hours changes in generation output/ demand – Nat Grid in the UK noted (June 2015) that the technical capacity of the UK system to provide minute through to multi-hour demand response is around 9GW. One would expect perhaps 15 in Germany. The 9GW has not been exploited – NG intends to do this – because it is very cheap. All the above is relevant to rising levels of RES. Technical and cost effective answers are available. Regarding voltage drop, smart PV inverters as installed in Germany are able to provide reactive power, inverters are able to do that since more than 10 years, and they don’t need batteries for that… And your claim about wind turbines having no inertia because they are connected to the grid throuh electronic converter is actually the total opposite ! That’s precisely because modern wind turbine have decoupled the frequency of the rotor from the frequency of the grid with power electronics that they can emulate intertia by storing energy in the rotor. With power electronic you have even access to faster ramp rates and greater flexibility. Actually every ancilary services the DSO is buying to the TSO can be provided by distributed generation (wind, solar, chp, p2heat) for cheaper and decrease also extensions and reinforcement. Balancing of energy generation, storage, and consumption can be realized most efficiently as near to the physical location of generation/storage/consumption as possible. So what you are describing is not a failure of DG, it’s a failure of a market design where companies are not paid based on the money spared by the consumer but based on their costs without anyone caring about the one who is paying the bill ! More detailed explaination about failures of market design for ancilary services in this paper from NREL. I think this will make the grid model obsolete. As I said in my Slideshare, power generation is moving in the opposite direction of computing – cloud to distributed. Now we will still need Nuclear Capacity, however, even that will most likely be distributed via SMRs for small communities. The author is broadly correct but fudges a few things. Current PPAs of $0.05/kWh in the US are subsidized by the ITC, accelerated depreciation, TOD pricing, and rely on capital at less than 4%. They are also in the sunniest part of the US in deserts. So without these benefits solar is still a bit expensive in deserts (about $0.08/kWh) and very expensive at average insolation. As the author shows, to benefit from the learning curve you have to double your cumulative capacity for a 15%-20% cost reduction. There is about 200GW installed today, so to half todays price which is about what is needed to get PV to be reasonably competitive, it needs about three doublings, or over 1GW of installed capacity. PV manufacturing capacity has been at about 50GW for the last four years and panel prices have been flat (after a precipitous fall). Yearly installs have been catching up to this capacity (around 40GW last year) and there is some signs of a beginning of some capacity expansion (though Yingli seems to be in trouble). To get to 1GW at today’s production rates would take 20 years. A high compound growth in manufacturing capacity could maybe half this time. This would take high demand. Given current pricing, demand is constrained by subsidy, so how much more governments are willing to subsidize has a lot to do with future growth. Subsidy has dropped drastically in Europe (with a commensurate drop in volume) and will drop in the US next year. Japan has started to pull back. The biggest subsidizer is China. They may be willing to subsidize more, but the current economic turmoil does not bode well. 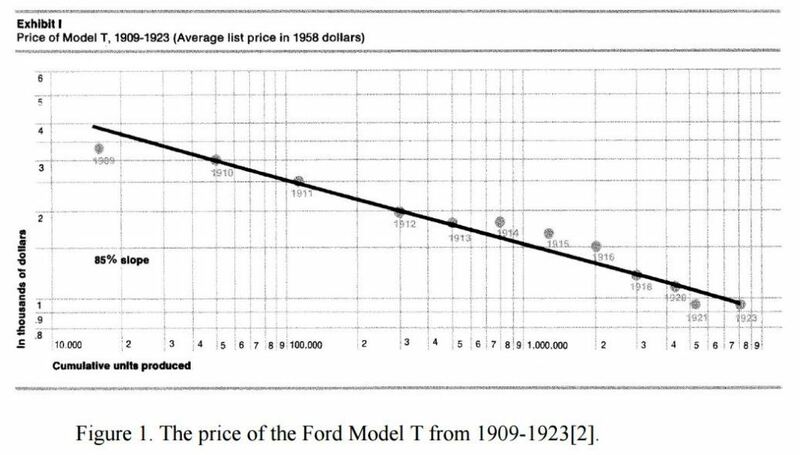 The long term price curve only operates if there is new more efficient manufacturing capacity installed. Prices are unlikely to fall much over current levels until manufacturers are profitable again. So this author is broadly correct. 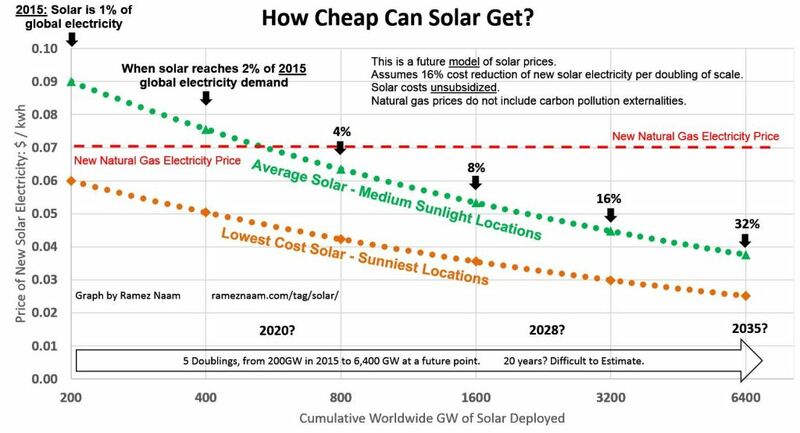 Solar will almost inevitably get cheaper over time. He is optimistic. Realism says it will take longer. The PV market has been amazingly volatile which has been hidden by China taking up the slack as europe fell into the abyss. Daytime intermittency and nighttime storage also loom as brakes in the background. Even with optimism this only projects around a third of electricity from solar by 2035. Electricity uses about 40% of primary energy, so we are looking at about 12% of primary (mostly CO2 producing energy) by 2035. Thats not nearly enough to get CO2 emissions down by any relevant amount, which after all is the primary reason to invest in solar energy. Go to http://www.stratosolar.com to check out a solution that makes today’s PV a solution that can realistically scale quickly and reduce CO2 emissions because of favourable economics and a solution that deals with daytime intermittency and nightime storage. You are a bit out of date with pricing. Warren Buffet runs the US company Berkshire Hathaway which owns NV Energy a power generator located in Nevada. The company has signed a power purchase agreement (PPA) with First Solar to buy power from that company’s 100MW PV plant at 3.87 cents/kWh for 20 years at a fixed rate (i.e. 3.87cents/kWhr for 20 years). RES subsidised? yep – just like shale gas and oil with their own tax perks. Even the World Bank & IMF have recently produced reports wrt fossil subsidies. Personally, I’d be happy to see fossil fuel externalities fully priced in & all subsidies (for fossil and RES) removed – it would be interesting to see who would then stand – & who would fall. There are many outliers on PPA’s both high and low. 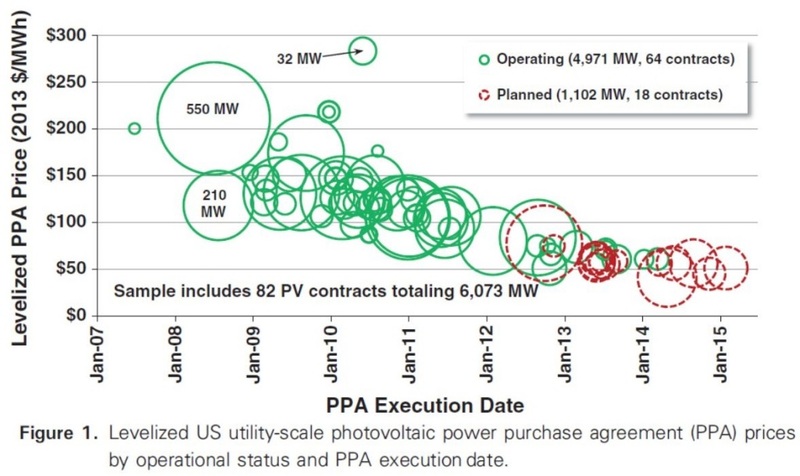 Each individual PPA is its own separate deal that has many variables. For example First Solar could have built the plant with extra subsidies during ARRA and has more than recouped their initial investment. Another possible interpretation is that given the competitive nature of the PV business and their uncompetitive thin film panels they need to sweeten the pot to keep their PV panel business alive for new deals. The original author of this thread did not cherry pick the lowest PPA price. Most fossil fuel subsidies are oil producing countries subsidizing low cost fuel for their citizens. The macro reality is PV is heavily subsidized and China is the biggest subsidizer. You can try and continue the 20 year failing battle to raise the price of fossil fuels or promote policies that make PV more competitive. Subsidized industries almost always become slaves to the subsidy. The recent drop in PV pricing came from the Chinese investing $50B in manufacturing capacity and breaking a cartel that had kept polysilicon prices high. The simplest way to make PV competitive is to fix its cost, daytime intermittency and night time storage problems and make it competitive without subsidies. Natural market forces will then prevail. East/West power grids can seriously help the problem of high demand in (for example) the United States. The east/west grids are already in place, so there is nothing extra to build, they don’t care if they are carrying electricity produced by solar panels, or by hydro dams, or coal power plants. We all know the Sun sets in L.A. hours later than in Boston, so as the Sun sets in Boston, the Sun is still high in the sky in the Central, Mountain and Pacific time zones. This allows solar power plants situated in the western U.S. to add significant amounts of power to the grid and the current flows eastward. For example, at 6:00pm in Boston, it is only 4:00pm in Bismarck, North Dakota, 3:00pm in Boise, and 2:00pm in Seattle. The opposite of this occurs in the am hours when the Sun rises on the east coast of the United States, the solar cells will be producing power for local use and to send westward as demand rises prior to the Sun rising in the Central, Mountain and Pacific time zones. It’s not a total solution, but it can dramatically mitigate the concerns around ‘when the Sun sets in Boston and New York, we suddenly have no more solar power’ — and the converse is true at Sunrise on the east coast. Not only can the U.S. take advantage of their huge east/west orientation, so can Canada, continental Europe, Russia, China and even Brazil/Peru/Ecuador, etc. I agree about the fact that people and enterprises will not use electricity only when sun shines or wind blows. As soon as inermittent source (solar and wind) reprsent a sunstantial share of the mix (more than 25%) the grid balance, and backup financial invetsments becomes unstable. Chemical (battery) storage cannot grow at the scale of global needs because batteries require natural resources. They are still abundant at low scale but would become rare if too large glabalization needed, and as of today batteries need aslo to be replaced after 7 years. The author speak of Fraunhofer ISE, the German research institute, and they have designed a plan to store energy in a viable and scalable manner that will not only deliver power when intermittent is down but will also provide fuel for transport and for chemicals under methane storage. RWE inaugurated a first plant this summer. Still tests … Now about cost.. even if solar panels will provide KWH at 4cts, the whole system – doubling generation to produce more than needed for storage, plant for power to gas, plants for gaz to power again which should be not only paid for what they produce but also for their availability when the do not produce.. with at each step energy losses.. might put the KWH of energy at some 50 cts, so at least double of current german price, and gas generated would also cost at least double of current Russian gas price for consumers in Germany. Still afordable for citizen and economy? It is true that every industrial product and activity gets cheap with time. Thanks for a very valuable post! I cant believe they go cheaper. This information sounds so new to me. Thanks a lot for sharing. I have learned something new today. Can we visualize global east west power grid at a future date, say 20 years from now, which will be fed by Solar power where whole world can keep using and half of the world Sun will be shining!